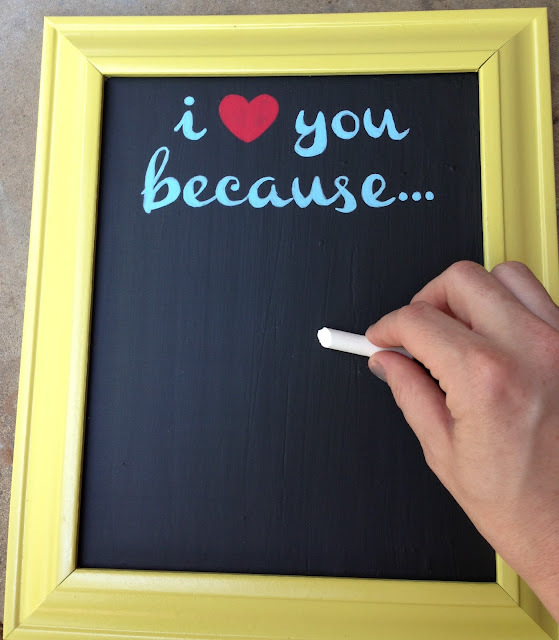 when i first saw the idea for an "i love you because..." chalkboard sign on pinterest, i knew that having one in our house to constantly remind jesse of his awesomeness would totally help me get some action. by "action," i, of course, mean, "you watch the kids while i eat cheese, read embarrassing fiction (seriously), and then fall asleep." but i noticed that the price for such a wondrous item was about $50. naturally, i figured i could make a passable version myself for much less. (if you arent DIY-ish , but want one of these, go buy yours from this creative, lovely genius, who provided the inspiration for my own DIY twist on this project). 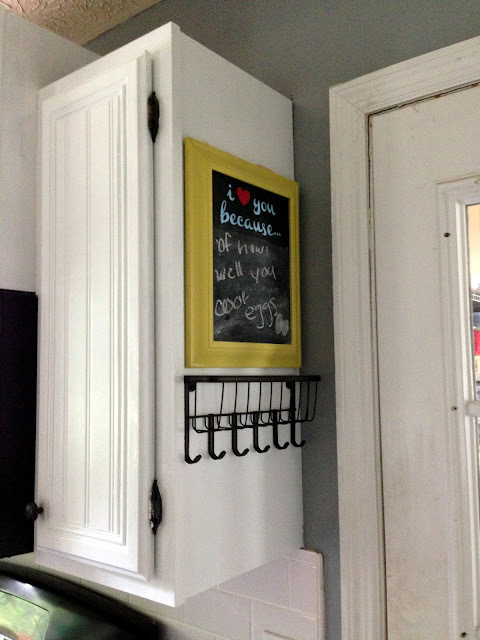 so not only did i make my own version for less than $5 (i already had the chalk paint), but it's actually more of my style than the one that is for sale because i was able to pick a font, frame and colors that felt like "me." 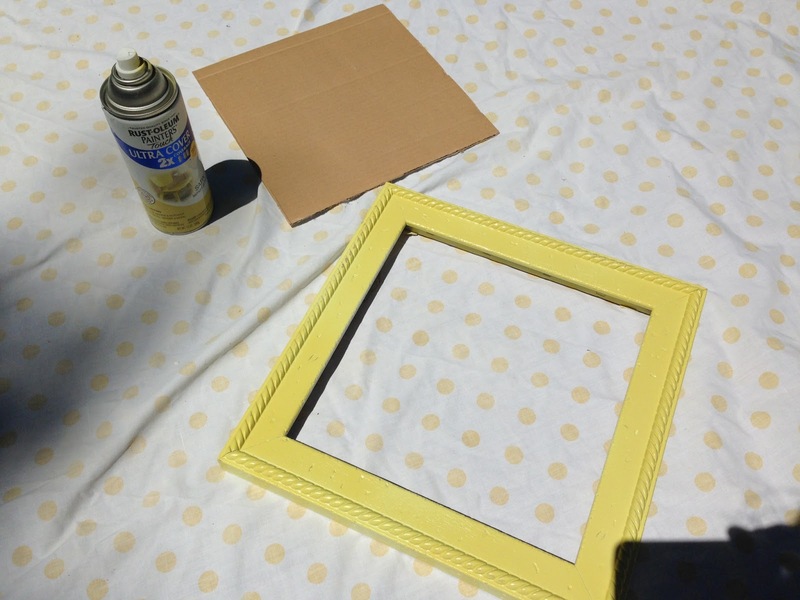 1. remove the glass and spray paint your frame (prime first if youre extra awesome). make sure to get all the weird, hidden angles and crevices, and resist the urge to go thick. many light coats is always best. 2. pretend this piece of wood is the glass from my frame. continue to pretend that i didnt break the glass and have to custom cut this thin piece of wood as a stand in. luckily, both glass and wood worked just splendidly for this project. it's easiest to just use your perfectly-sized and smooth glass. 3. stir the chalkboard paint very well and then start applying it to the surface of your glass/wood with a brush (i used this modge podge one because it was cheap and i could toss it after...washing out paintbrushes is of the devil). 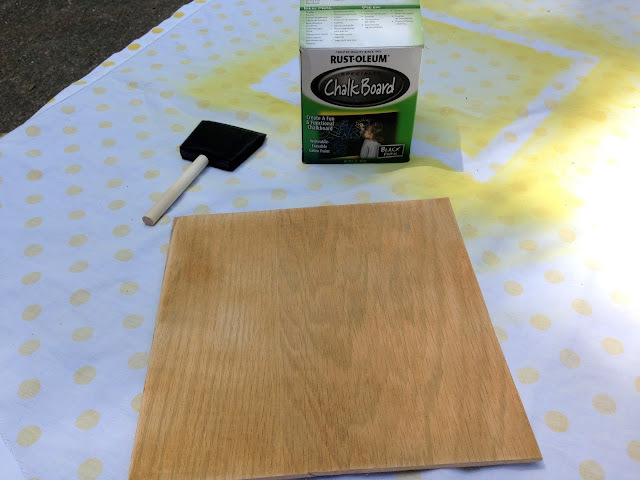 you'll need a few coats and will want each to dry before applying subsequent coats. 4. set up a word doc (or whatever the cool kids use these days) with your chosen font and size/spacing options for how you are going to want your permanent saying to look. i used the free font "channel" and just googled "heart graphic" to get my chosen buddies. print it out and place it behind your (empty, spray painted) frame to get an idea for the sizing. you may need to play around with it on your computer until it's just the right fit. 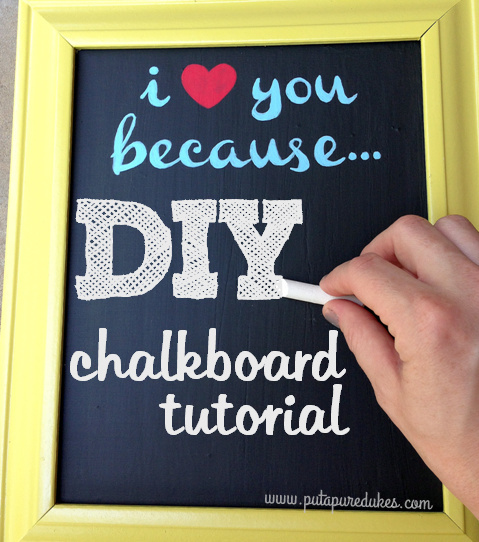 5. once you have the perfect-sized printout, you are ready to transfer the pretty writing onto your (now dry) chalkboard surface. lay the paper over the top of the chalkboard exactly where you will want the letters to be. tape to hold in place. 7. check to be sure your entire phrase outline has transferred visibly into the chalk paint below. if you have a good outline you can remove your paper template. 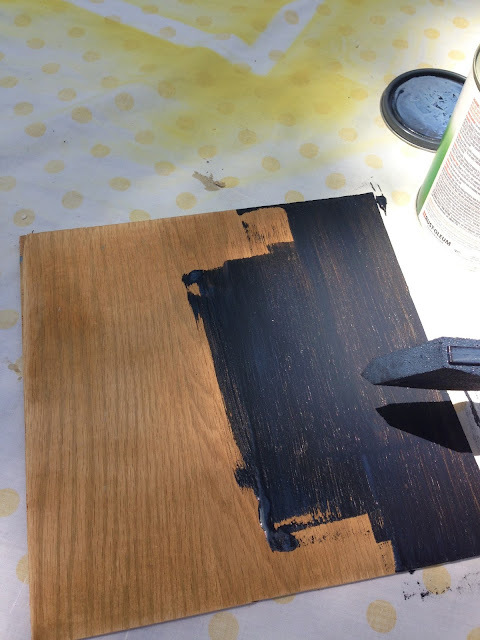 8. get your fine-tipped paintbrush and start painting within your outlines. the indentations from the pen will make little paint gutters, making it easy to stay inside the lines of even a fairly scripty, finnicky font like mine (which i could NEVER freehand paint without tragedy striking). 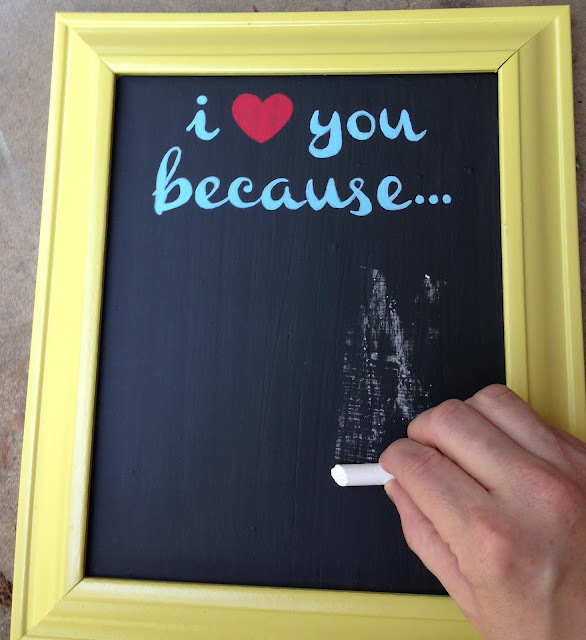 9. this is the hard part: WAIT THREE DAYS for your chalkboard paint to cure before you put any chalk on it. i had to hide mine in a coat closet because i lack the self-control it would have required to keep seeing the chalkboard and NOT write on it. 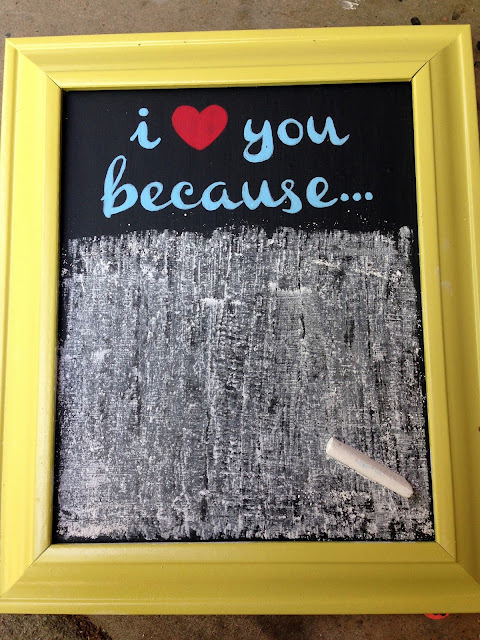 after the three days, you are ready to put the chalkboard in its frame and then break out your box of dusty buddies and get to writing! 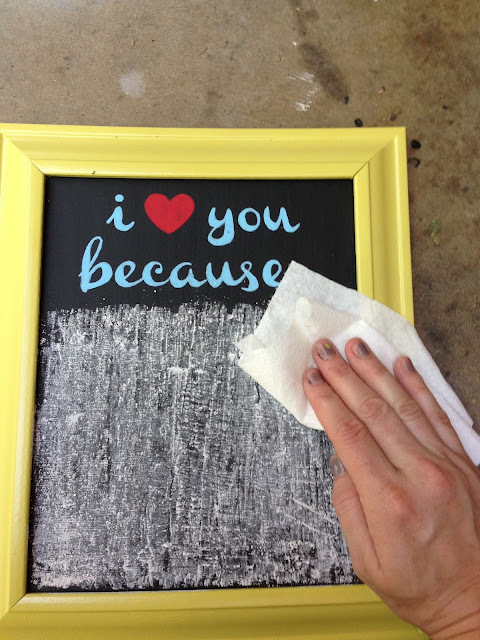 11. after it's good and chalky all over the writing area, wipe it off with a DRY cloth or paper towel. doesnt that look just as perfectly-seasoned as a grade-A steak? now you're ready to tell your sugar-sweets just how he/she gets your motor turning. 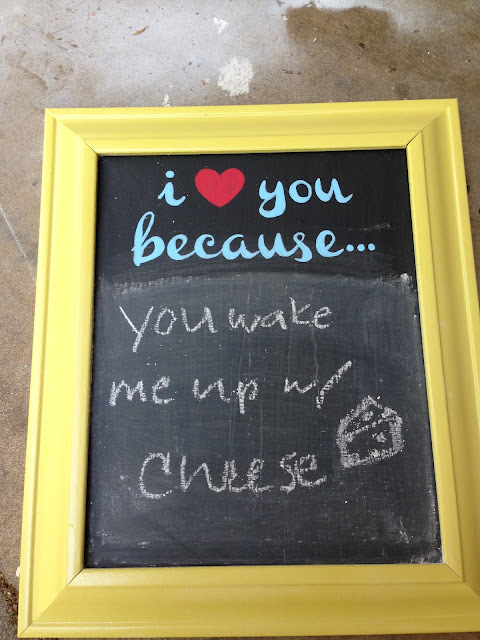 obviously the first thing in my mind involves cheese and sleep. true story: if jesse is waking me up from a nap, he has learned that i WILL be grumpy and has finally found a great way to avoid getting snapped at: he hands me a chunk of cheese immediately after waking me. this is to quiet the monster as i transition to human. not even joking. it's like how divers throw chum in the water to draw the sharks so they can swim elsewhere without getting eaten alive. most of jesse's marriage advice comes from shark week. i hung our sign right over our keyhook/mailbasket by the garage door where we leave and enter the house every day.you could make your own key attachment by just screwing little hooks into the frame as well. 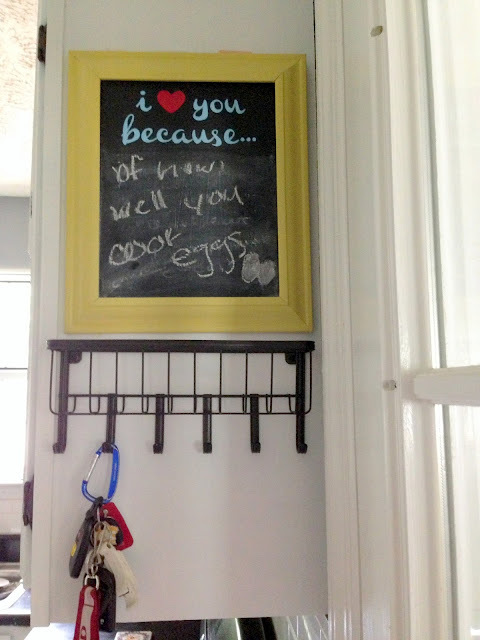 since we are the only two literate people in the house right now, there's no guessing about who wrote each note. (this one was me, too. is it possible that i only love jesse because he gives me food? how cavewoman of me). that's it! now go get your dusty love-talk on! Haha funny! 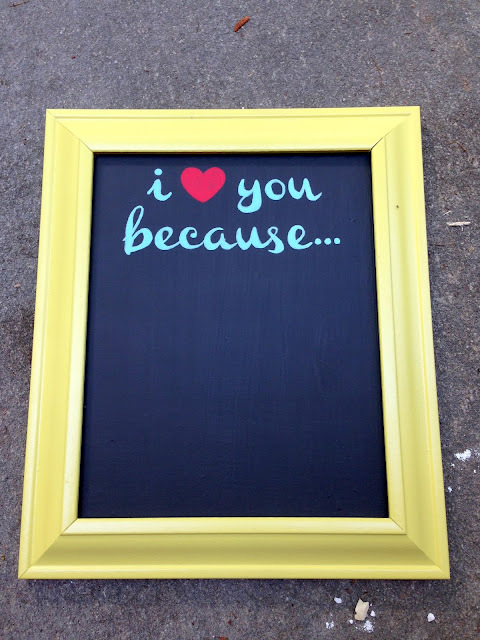 I just posted this same thing last week...I made one for Josh for our anniversary! Your cleverness and love for Jesse constantly inspires me!! 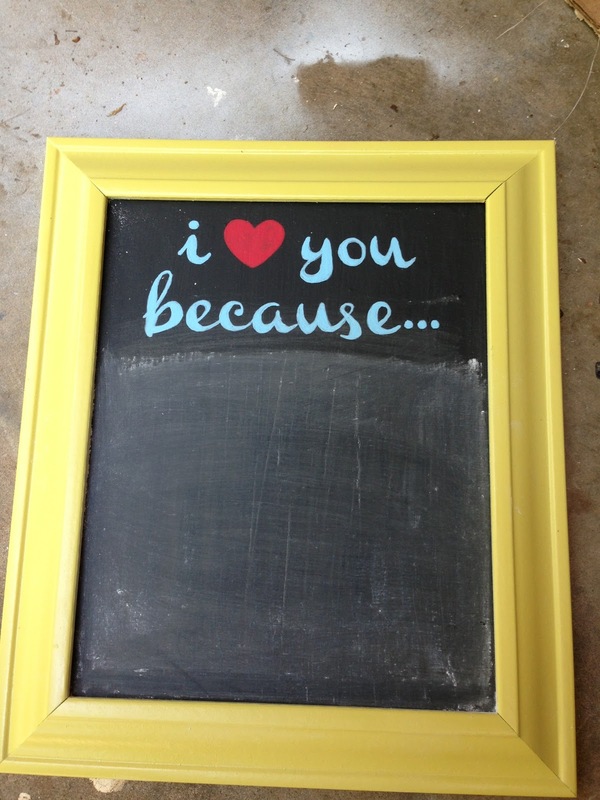 The chalkboard is AMAZING!